Think coconut oil is the same as MCT oil? What’s the optimal level for blood ketones? What are 2 key strategies you need to implement to hit this sweet spot? Is counting net carbs holding you back from optimizing your keto diet results? What are 5 tips to get back into ketosis after a cheat day? 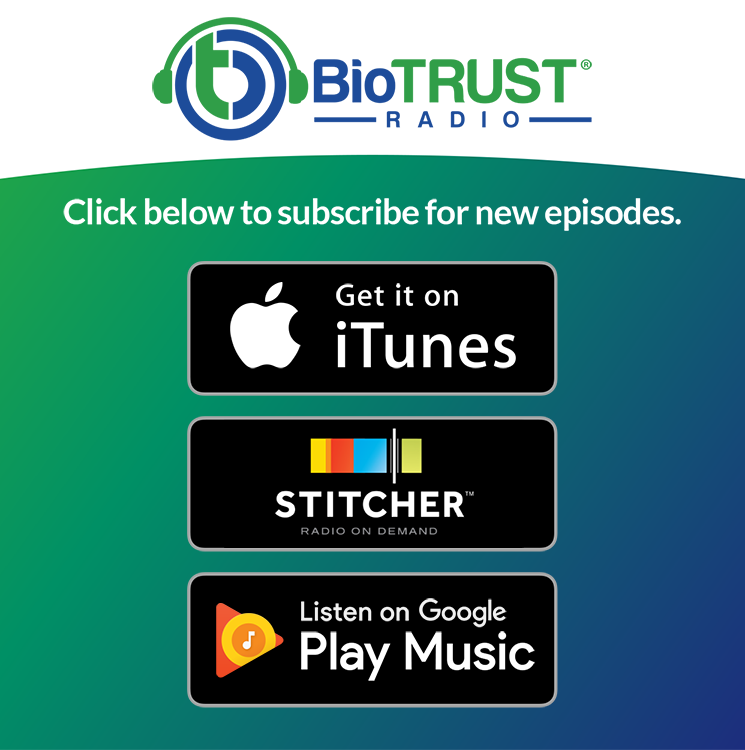 Get answers to these burning keto diet questions and much, much more in this must-listen episode of the BioTrust Radio podcast. Having a hard time hitting your macros – especially when it comes to getting enough fat? This may be the reason for brain fog and the keto flu. Find out how to make fat bombs and what the best keto diet foods are to make sure you’re getting plenty of fat. If you’ve been using coconut oil to reap the ketogenic benefits of MCTs, think again. Find out the crucial differences between MCT oil and coconut oil and which is best to maximize keto diet results. What is the optimal level of blood ketones? Where is that “magic level” where you can expect to experience cognitive clarity, appetite suppression, a surge of energy, and all the other highly touted benefits of the keto diet? The 2 key strategies you can implement if you’re struggling to hit this magic spot. Should you be counting TOTAL carbs or NET carbs? Find out how some of these new engineered fibers and sugar alcohols may be holding you back from maximizing your keto diet results. Is it okay to have a cheat day or cheat meal on the keto diet? Our top 5 tricks to get back into ketosis after overeating carbs. Shawn: All right, welcome back to BioTrust Radio. We are in a very interesting location. We’re not in our studio in Dallas. We are at Traffic and Conversion Summit 2018. We’re learning how to create a better community for the BioTrust group. And if you already are a BioTrust VIP on Facebook, then you know, the community we’re building. It’s very important, I think. We’re seeing more than ever the importance of community. We’re getting more questions, we’re getting more transformation stories. We’ve always had good supplements, you know, a good product out there, but I think we’re coming to a greater realization of just how important and incredible our customers are. Again, it’s not something that is new to us, but in some ways it is, just how powerful they are, and how great these stories are. Tim: Yeah, it’s extremely powerful, Shawn. Like right now we’re in the middle of a 12-week transformation contest, and to see the changes that are being made. People share a number of weight loss that they’re experiencing. That’s why we call it a transformation contest because it’s literally transformational to their lives, which is infectious to the people around them. And we see that within the group where one person making progress lights a fire under someone else to continue to make progress. It’s so inspiring, so incredible. One of the most popular diets that people are following in our own community is a microcosm of what’s popular in the world, really, today, and that’s the keto diet. So we want to talk today with resident keto expert, Shawn Wells, about some questions that we’ve been getting and just kind of, not clear the air, but because it has becomes so popular in mainstream, there’s some things that have deviated. I think there’s just more questions that come up as people are trying to learn. Tim: We’re going to kind of do a keto diet Q&A and see where that leads us. Shawn: Sounds good, Tim. Yeah, I think now more than ever there’s more information on the keto diet, but there’s also more bad information on keto, so we might want to try and clarify. And we’ve found that the keto diet is a very popular subject on the podcast. And like you said, in the VIP Facebook, with the transformation challenge, but it’s everywhere and anywhere. I called GoDaddy to nail down a site the other day and I ended up talking to the guy and he’s like, “Oh-oh! I’m getting into keto. Like, tell me some stuff,” and I was talking to the GoDaddy rep about the keto diet. So, it comes up constantly. So, what do you have to throw at me here? Tim: Well, let’s start with maybe something that’s a little bit more on the simple side. One of the most common questions or concerns that we get is that people have a hard time hitting their macros, especially when it comes to fat, because a lot of people they’re coming from a lower fat type of approach. And when I say low fat, low fat’s defined by 30% or less of calories. So it’s not necessarily super-low. But going from 30% to 70-80% calories, it’s a ginormous jump for a lot of people. Tim: You know, if I’m having difficulties meeting my fat macros, do you have suggestions or maybe you can peel that question apart however you see fit, but that’s one that comes up, people just having a hard time getting enough fat. Shawn: Yeah, I see that a lot, and usually when I talk to someone and they have brain fog and they’re having issues, keto flu and all this stuff, nine times out of ten it’s because their fat isn’t high enough. And they’re eating clean, which means they’ve always deemed as low fat, and now over the past 10-15 years, low carb. So they’re eating low fat, low carb, which leaves protein. Which proteins are obviously a great nutrient and we talk about it all the time, and its importance. I’m definitely for getting enough protein, quality protein. Especially in our realm of sports nutrition it’s very talked about. But the problem is when your fat is low, your carbs are low, and your protein is high, that protein is getting converted over to glucose through a process called gluconeogenesis—some people abbreviate it GNG. But that can leave you with the “hangry” state. I know I used to do something very similar. I used to do low carb but super high protein, and I was also doing the six small meals a day, and all the stuff that I was told to do. I felt like I was always ravenously hungry. And just small fluctuations can result in that hypoglycemic feeling, that low blood sugar feeling. Low blood sugar, I don’t think people understand. Like I used to work clinically, and we’d have people that have a 300, that were actually experiencing hypoglycemia. Why? Because their baseline was 500. In this case you would want to give them orange juice or glucagon or something like that to bring them back up. Shawn: And that seems counterintuitive. If someone like a nurse checks and he’s a 300, you know, we should give him insulin, but that would actually potentially put them into a coma. Shawn: So, you have to understand that it’s not the absolute number, per se. It’s about that threshold. And if you’re tightly held with your blood glucose, let’s say you only range from 70 to 90 because you’re always just eating protein and you don’t have the carbohydrate type fluctuations, then even like a dip of 10 points can feel like a dip of 50 points, like when you’re eating a lot of carbs. So this is where it’s different and people think like why am I feeling like crazy low blood sugar if I’m so well maintained. Shawn: So that’s what I’ve found. They need to add the fat in. So that comes in and you’ll read all these recipes about fat bombs. And it’s super easy to take something like coconut oil, some cocoa, some stevia, throw it in the freezer and you’ve got a fat bomb. Certainly you’re not shying away from cooking with oils, butters, and things like that. You can use heavy cream in your coffee. That’s a fat bomb. I don’t do caffeine, but I’ll still do the fat bomb when I’m on the road. You go to Starbucks, you get a venti, a large drink, and add heavy cream to it and you’ve got a fat bomb. It’s just pure fat. So, it is a bit of a mind shift to accept that high fat is okay. You also have to understand that this is as a percent of calories that you’re having 70%. It’s not percentage of grams or mass of the fat protein and carbs. Because fat is 9 calories per gram and protein and carbs are 4 calories per gram. So it’s a little more than twice as calorically dense when you eat fat. So that’s something to keep in mind that fat itself provides a higher amount of calorie. Shawn: And that’s the reason why, evolutionarily, fat is a good storage mechanism for energy. Now we’re in a surplus of food and we have too much body fat and that’s not the best thing, but it makes sense to have fat in terms of survival. And if you see people that do like long hikes or, you know, rowing trips or whatever, they actually bulk up for those reasons, so that they can store energy. Just like a grizzly bear does or whatever. So, hopefully that answers that. Tim: Yeah, no, that’s super helpful. And I think kind of coming back to a few things that you mentioned there, maybe you don’t always have to count everything, but maybe if you’re just getting started on keto diet, then you have an idea of where you want to be in terms of calories, carbs, proteins, and fats. And these targets can vary from person to person, based on activity level and things like that. But carbs usually set somewhere between like 20 and 30 grams, protein could vary between maybe 20% to even 30%, maybe 25% percent. Which may work out to 0.50 to 0.75 grams per pound, and then the rest of calories coming from fat. But like you were saying, divide that number by 9 to figure out how many grams of fat you’re having. Make sure you’re eating whole foods that contain fats. Things like eggs, fatty fish, nuts, seeds. Make sure those are a bulk of your food intake, but then adding coconut oil, which you mentioned, olive oil, and things like. You can even add these things to your protein shakes, if you’re having any of those. But since you did mention coconut oil, I think that brings up another great question that we often get, “Is coconut oil the same things MCT oil? What’s the difference between those two? Should I be using those?” But let’s just maybe focus in on one part of that question. Is coconut oil the same thing as MCT oil? Shawn: No, it’s not. You have some other fatty acids in it. Tim: Let me interrupt you for just a second, Shawn. For people that have heard of MCT oil, let’s just say what does MCT stand? Shawn: Medium chain triglyceride or they also get called medium chain fatty acids. And those are unique because how they get metabolized. They can be used directly for energy and they actually raise your endogenous, in the body, levels of ketones; whereas most of the fatty acids don’t have that effect. So what we’ve found is that it’s not only just the medium chain, but even the short chain fatty acids also do this. One of the short chain fatty acids, butyrate, you hear about a lot because that’s important for gut health. And if you know ketones, one of the key ketones is beta hydroxybutyrate, which means it’s butyrate-based. And you can find that short chain fatty acid in heavy cream and butter and some of those sources. But going back to the medium chain, they do convert pretty well to ketones, so that’s why people on this diet like them. Coconut oil has some other compounds in it. There’s fatty acids in it, like lauric acid, that have benefit, certainly. I love cooking with coconut oil. And if you like the taste of coconut oil, it’s good. I’d include both in my keto diet. But MCTs are about three times more effective at raising ketones than coconut oil is. And then one specific MCT is three times better than MCTs. I if you get caprylic acid, which is C8. So you’ll see some of these oils, they’ll be called like a keto MCT or C8 oil or something like that. That’s going to be about 9 or 10 times more potent at raising ketones than coconut oil would be. So, that’s kind of the progression. I would say, coconut oil, MCTs are three times better than that, 9 or 10 times better than coconut oil and three times better than MCTs, are C8 or caprylic acid oil. And MCTs and C8 are pretty tasteless. If you get an extra virgin coconut oil, it will have that unique coconut flavor, taste, smell. You can get a fractionated coconut oil that doesn’t have that smell or taste, if that’s an issue for you. Sometimes it’s an issue for people. And it has a good smoke point. It’s a saturated fat. It’s coconut oil, so it’s great to cook with. I love to use it for those reasons. Tim: Yeah, that’s an awesome summary, Shawn. So my kind of takeaway is that medium chain triglycerides, basically medium refers to the length of the fat, and there’s specifically referring to the number of carbons that are in that fat. Tim: And so you have C8 and C10, which means 8 carbons and 10 carbons. Caprylic and capric acid. There’s also C6, which is less prevalent hexanoic acid, I think is what it’s called? Tim: So, you have C8 and C10, really the most prominent MCTs, which from a food standpoint are most prevalent in coconut oil, right? Like coconut oil is the most dense food source of these MCTs. It’s found also in things like palm oil and butter, and heavy cream to some extent, too, just in a lower amount. And I think—I may be incorrect about this, but I think coconut oil is only about 20-30% MCT. Tim: And the rest is that lauric acid, which like you talked about, has antimicrobial benefits. So, the reason that MCTs get all this popularity, like you were saying, is because they are one of the few foods essentially that are ketogenic. That the body actually converts directly to ketones, so they’re very attractive. And research on these MCTs shows an ppetite suppressing effect, which probably relates back to the ketogenesis. And then there may be some metabolism-boosting effects. So, there’s some cool research behind the MCTs, which has led some people to translate those benefits to coconut oil. However, from what I’ve seen, they were talking about like somewhere in the range of like 20 grams of MCTs to have that type of effect. And like I said, coconut oil, a tablespoon of coconut oil, and they only have like 4-5 grams. So, be careful not to confuse the two, but they each may have their own benefits, if I’m kind of summarizing correctly. Shawn: That’s perfect, Tim. Perfect summarization, yeah. Tim: So, another question that comes up really often is, speaking of ketosis and levels of ketones on the keto diet, would you say there’s an optimal level of blood ketones. Shawn: Yeah. So, you look at millimoles of BHB. And you can do this with a glucometer. They’re expensive to get the blood levels. There is a new monitor called Keto Mojo that has the strips at about a dollar. Which is a breakthrough because up until this guy really who’s trying to solve metabolic disease, and he’s really just generous with his efforts in this area. He’s not really trying to cash in on any way. Because normally these strips cost like 8 bucks. Shawn: And that’s very cost-prohibitive. Whenever you want to take your blood BHB, your blood ketones, to spend $8 per use. So, people have been stuck using other methods that are less accurate, like looking at acetone in the breath or the urinary strips, which aren’t very accurate. There’s some correlation, but there’s some issues with those. The best case scenario is blood BHB. Shawn: And I would say that comes at, you know, maybe a 2-4 or 5 range. You can actually get too high, like maybe in that 6 or 7 range, where you start kind of declining in energy again. So there is kind of a magic area, I think, that you’ll feel. The issue is most people that are on the keto diet are eating often, they’re eating treats, they’re snacking keto snacks, they’re doing net carb things, and they’re never getting to that magic spot. You know, some people are saying they don’t feel this thing that other people are talking about. I would say, initially, you should get rid of the idea of net carbs. We can talk about what that is in a minute. Shawn: You should just do 20 grams of carbs, period, and get adapted. Once you’re adapted, you can start playing around with net carbs, especially if you’re getting data and seeing how it affects your body. There’s some of these things that we call net carbs affect different people differently. Shawn: Sugar alcohols and short chain fibers, especially can be unique in how they get metabolized person-to-person. So, that’s what I would do. I would look at net carbs—drop that—and I would do fasting. And certainly add in fasting if you want to get into that deeper state of ketosis. It can be miraculous if you do that fast. Tim: Awesome. So when you’re talking about the fasting, you mean maybe like a time restricted feeding, where you’re limiting your feeding window. Shawn: Yeah, exactly. The popular ones are 16 and 8, 20 and 4, or every other day. Shawn: Every other day might be hard for some people, initially. Shawn: It’s the same thing. You know, get adapted. I would start at the 16 and 8, where it’s 16 hours not eating, 8 hours eating. It’s not too hard when you take your time sleeping as 8 hours and then just to add another 8 hours on to either end of that. And then, you know, you can work from there. It becomes easier over time. After about your third or fourth day of fasting, I’ve found that that’s where it stops being difficult. And then you start feeling like “Ah, this is actually pretty easy.” And then when you combine that with that feeling of cognitive clarity, you’ll start chasing that. Tim: Yeah, exactly. And I think that has a lot of power, the fasting does, for a lot of reasons. Combined with the nutritional ketosis, which may have an appetite suppressing effect in and of itself is because I think it really helps consider am I really hungry or am I just going to be eating out of habit? So, I think there’s an awareness component. I love the guidelines to say hey, you know, 16 and 8, 4 and 20, but if someone’s used to having a 12-hour feeding window, maybe they just turn it back like 2 hours. Maybe it’s 10 and 14, and then they graduate into 8. There’s not necessarily magic to it, but like you’re saying, collect some data, right? Tim: That’s where the blood testing may come in handy. I think, you know, we talked about this before, but your friend Luis Villasenor talks about not necessarily chasing ketones. That’s not the objective, right? What you’re chasing is this mental clarity, this energy, weight loss, and things like. Shawn: That a great point. Tim: I love how you framed it. You’re just trying to find data to associate to the outcome that you desire. Do you have kind of a rule of thumb for how often people should be testing or is this a tool to use early on? Shawn: Yeah, exactly. Early on it’s very important for you to start associating, okay, I feel this way with this number. But yes, you’re right. Over time, you’re just looking at more of the subjective measures, like how do I feel, how much energy do I have, how hungry am I. But exactly. It’s just like with blood glucose, blood sugar. As you become more insulin-sensitive, your blood glucose isn’t going to be rising as much, and so we’re not chasing a high glucose level for energy. It’s the same with ketones. As you become more ketone sensitive, you up regulate these things called MCT transporters. You have mitochondrial biogenesis, and all these kinds of things going on, which just means creating more mitochondria. That you’re making adaptations and your ketones don’t have to get as high to experience ketogenic nutritional ketosis or this magic feeling of cognition that’s clear and reduced appetite, and all those kinds of things. You actually start achieving that at lower levels. Shawn: So, yes, like to his point about chasing that number, you don’t want to overly chase that number. It helps early on and it’s good to check in every now and then, but you don’t want to do that. Shawn: There is a new number that’s coming out that Jeff Volek, who’s a great researcher talks about, and it’s a ratio of blood glucose and a ratio of ketones, so blood ketones. The thing I like about that is most likely as you’re making adaptations into ketosis, you’re also improving your insulin sensitivity and probably lowering your blood glucose. So now this ratio might, overall, stay fairly accurate to reflect what state you’re in. Tim: Yeah. That’s awesome. I like it. So basically what you’re saying is there’s probably an inverse relationship between blood glucose and blood ketone levels. And if you’re a data geek, like you and I are, then it may be cool to collect both of those, and that may be more telling. You’re also saying that we can be more efficient at using ketones over time, and so what we may have used to need a level 4 to get to this certain level because we didn’t use them as much. They’re in-sync, so to speak. But now we dispose of them or use them more readily now, so we might experience the same thing at a level 2. Tim: Awesome. So we talked about ketone levels, fat, and you touched on net carb. So let’s move into net carbs because this is an area that you’ve talked about before, that I think is powerful because we’re seeing all these keto diet treats and things like that and all different ingredients that are classified as net carbs. So, just as a brief background, the keto diet is very low carbohydrate, typically somewhere between 20 and 30 grams. And what we see is that some people say just 20-30 grams carbs, period, including fiber and all that kind of stuff, and some people say 20 or 30 grams of net carbs, which could be a higher total carbohydrate amount because net carbs is essentially the amount of total carbohydrate minus carbohydrates that don’t impact blood glucose levels, or supposedly don’t impact blood glucose levels. And the best examples of those would be fiber. So if you looked at a nutrition label and it said 8 grams of total carb, 4 grams of fiber, it would have 4 grams of net carbs. So, let’s talk a little bit about net carbs. You already mentioned that getting started on a keto diet, it’s best to count total carbohydrate. But why don’t you weigh in a little bit on your thoughts on net carbs. Shawn: Yeah, so net carbs, it really started with Dr. Atkins, and he really created a lot of energy around the ketogenic movement. The keto diet is really a modified Atkins, but Atkins is close, and maybe it’s most like the initiation phase of Atkins, which is going to be similar to what I’m going to talk about. It’s very strict at the beginning and then you get a little bit more leeway as you go on. Atkins was popular in the 70s and the 90s, and now it’s just straight keto. The difference is Atkins could have been higher protein, potentially, where we have that gluconeogenesis that we were talking about, and then, again, this net carbs thing. So, net carbs, you subtract out sugar alcohols and fiber. The problem is there is obviously individual differences. But sugar alcohols are different, one to another, as well. You know, their glycemic index is different. And with fibers, there’s different fibers. Some of these short chain fibers, like IMO (isomaltooligosaccharide). People may have seen those in bars and things like that. Those are up to 70% sugar, but they’re called fibers. So, you know, this can create an issue. I’d be careful with this whole idea of net carbs, especially now with these engineered foods that you have these engineered fibers, and you have these engineered sugar alcohols, and those are causing unique fluctuations in blood sugar. The other thing that’s going to be impactful here is how much of it are you having, the amount of fat in your meal that’s going to change. All that stuff changes the glycemic impact of all that. Shawn: I’ve known like some big bodybuilders that can do 100-120 grams and still be in. Shawn: So that’s an interesting one that I’ve just found over times is that lean body mass kind of dictates your threshold for carbs. Shawn: Yeah. So that might be like just, you know, if we’re going to get geeky like the GLUT4 translocation, like pulling glucose into the cell faster because they have more lean body mass, the muscle. I don’t know. I haven’t seen a definitive answer for it, but it’s definitely a phenomenon that I’ve noticed. Tim: Well, certainly one thing with keto diet becoming so popular is that we are seeing so much more research into it. And so maybe that’s something that we can look into, moving forward, because that individualize approach can be super helpful. We have a better idea—we still don’t know for sure—but we have a better idea that protein intake should be body weight-related as opposed to just being 50 grams per day or whatever. Tim: Now we know that we’re getting closer to that, so maybe there is a carb intake based on lean body mass. That would be pretty cool to see. Shawn: That would be cool. Tim: So maybe we can figure that out. Maybe we’ll have to experiment with that a little bit, too. So, that’s super helpful on net carbs. And since we’re talking about carbs, leads me into my last question that comes up really often. People basically asked can I have a cheat day, or here’s one way that it’s been asked of me, “If I have a cheat day and eat too many carbs in one day, does it ruin all the time and effort I’ve put into getting into ketosis or being keto?” So, is the cheat day going to ruin it? Can I have some carbs here and there? Shawn: Yeah, you’ve got to live your life. If you’re just looking at it as a diet so that you can do some crash thing over 12 weeks, you’re going to just drop some weight and it’s not a lifestyle, then maybe don’t have your “cheat day,” but I wouldn’t recommend that. I would recommend that keto is your lifestyle – it’s not just the keto diet. Shawn: A lot of people say the keto diet is too difficult to maintain as the lifestyle. I want some carbs here and there. Well then, plan your carbs and have your carbs and enjoy it. And that’s not an issue to have your carbs here and there. I do CKD and TKD. And so that’s Cyclical Keto Dieting and Targeted Keto Dieting. What he’s talking about, with the planned cheat day, which we’ve talked about not even liking the term “cheat” maybe. Shawn: Because it’s planned and it’s okay. It’s not cheating. It’s not a bad thing. You know, carbs are a tool. They’re not necessary, but they’re tool. So I look at it as something I enjoy. I plan it out and I have one meal a week or, you know, I might have a whole day every two weeks where I just have whatever carbs stuff I want. They could be pop-tarts and pizza, and whatever. It’s okay. If that’s what you’re craving and you feel like you need that occasionally, then plan it. Shawn: And it’s okay. Plan it. For the targeted part, like I play sand volleyball in the heat in Dallas and I can play anywhere from like 3 to 8 hours in a day, straight. So it’s a lot of effort and I like being ketogenically adapted, being able to use my ketones, but also adding in simple carbs. Basically, on these targeted days or moments, I use very simple sugar. It’s not just the things that I feel like I’m missing out on. Like I literally just use Gatorade or candy or something like that that’s mostly sugar, very low protein, very low fat because I’m just using it for fuel. And I might do that over the course of the first, let’s say if I am playing 8 hours, I might do that over the first 2, 3, or 4 hours. I’ve found—and this could be because I’m ketogenically adapted and I’m doing something that’s dynamic—but I’m already back in ketosis that evening. Shawn: Because I’m just giving myself simple sugar, I’m burning through it and using it. Shawn: So, that’s unique. You know, you can have carbs and you can be ketogenic. It’s not the end of the world. You just plan it. You use them strategically. Shawn: And that’s what I look at carbs as a strategic tool to use. One, because I enjoy them, so that’s strategic for me mentally because I don’t want to deprive myself forever. Two, they can give me energy. So, that’s the way I look at it. I think it’s a healthy way for me to maintain this for life. Shawn: And that’s what I’ve done. I’ve done this for 20 years now, so it’s maintainable. I would say early on, it’s best to not do cyclical or targeted keto dieting. Shawn: It would be great if the first 90 days you could make these adaptations. They’ve shown adaptations over two weeks, but I think 90 days is best to regulate these transporters I was talking about, have mitochondrial biogenesis, get used to the feeling of what keto is, and then at 90 days start employing a cyclical or targeted or both. Shawn: You have more tolerance to carbohydrate, again, the leaner you are and the more muscle mass you have. So that’s something to think about too is that if you’re going to use both CKD and TKD, you know, that again I would wait until you’re further into your goals, if you have a lot to lose. Tim: Yeah. And more active, along those lines too, for sure. Tim: Awesome. And I like the idea of committing to a strict keto diet for 90 days and allow yourself to adapt, because like you’re talking about—we’ve mentioned this term before, metabolic flexibility. You’re so flexible, metabolically, that you can burn through those carbs and flip right back over to ketosis within hours; whereas, for someone else that might take a little bit longer. And along those lines, if someone does incorporate that cheat day or have some carbs, it’s not the end of the world, like we’ve talked about. It’s normal. But, are there some strategies to kind of help accelerate getting back into ketosis after a cheat day or something like that? You mentioned fasting can help, right? Intermittent fasting can be a useful tool. Maybe the next day you just prolong how long you do it, or maybe it’s a full fast day. Shawn: I use IC-5. That’s a big one for me. The berberine in IC-5 is unbelievable at how quickly it puts me back in ketosis. It is amazing. It’s crazy. I’ve never seen anything like it. It’s very powerful. Also using some MCTs at that point could be strategic, as well, in a way that yes it’s exogenous in the sense that you’re supplementing with it, but what happens is you’re at least acutely up-regulating these MCT transporters and you’re making some changes in your body, some adaptations that you’re forcing with these MCTs. That can be helpful. So I’d recommend, like you said, fasting. That definitely helps. Switching from this high sugar thing that you’re doing to a high fat thing, and potentially like that first meal just being more like a fat bomb. Shawn: Low carbs and maybe even low protein. Shawn: And just doing a fat bomb. Then maybe using MCTs. Also, you can help glycogen deplete with some high-intensity interval training exercise. You know, the higher intensity it is, the quicker you’ll deplete glycogen and get back to ketosis. So those are some strategies I would use. Tim: That’s awesome. There was one more thing that we had talked about before, that just remember, it’s best to plan it. Seems like it’s best to plan it because these planned diet breaks, so to speak, can actually increase compliance. Tim: But if it’s unplanned, just remember, we’re not perfect. This happens with all of us and you still are pretty awesome at life, even if you fall off the wagon, because we all do. We all have hiccups and make mistakes. So, just remember, you don’t have to be perfect. It’s part of the day. Shawn: Right. And you know, evolutionarily, if we were just eating meat and we were a carnivore through the winter or whatever, there’s a good chance that here and there we’d have some carbs. Shawn: And, you know, it’s okay. If this is big picture and this is about your life, then it’s okay to be out of ketosis here and there. It’s not a big deal. If you’re trying to maximize your fat loss as quick as possible, it makes a difference. But if you’re on it for the next 50 years, it doesn’t make a difference. Tim: It’s a drop of the ocean. Shawn: It’s a drop in the ocean. So don’t beat yourself up about it. I mean, it’s completely realistic to live in this world and enjoy some of the foods of this world. But I think fasting and keto dieting does help you take the power back. It helps you beat back some of these bliss point foods that we’ve talked about. Shawn: These are very empowering things, psychologically. I know it’s helped me a lot. You know, you go to a restaurant when you’re keto, you’re like, can I have my coffee with heavy cream, can I have butter with that. You start making requests and then you also push away the chips or the bread at the table. Over time, that becomes very empowering, that you’re okay to make decisions. The other people at the table may be eating one way, but you’re okay saying, “I’m not going to eat like everyone else.” And that’s hard at first. Shawn: But it gets easier over time. And I feel like that’s one of the joys of this diet is taking the power back, being unique, and getting all the benefits of keto dieting that we talked about, physiologically. But mentally, I think there’s benefits too. Tim: That level of blood ketones, for sure. Like you said, there’s definitely an element of control and empowerment there. And then empowering others to do the same, to make choices. Tim: That’s awesome, Shawn. A great way to wrap things up. That was a superb keto diet Q&A. I really appreciate you dropping all that knowledge. Shawn: Yeah, absolutely. I enjoyed it. So, another plug to our VIP Facebook group, which many are doing keto dieting. You just look up VIP BioTrust on Facebook. And then we also have the blog on Biotrust.com, and then BioTrust Radio at BioTrust Radio.com, of course. Look us up on BioTrust Radio.com. There’s all the transcripts, but we’re also on iTunes and Stitcher, and all those places that you like to subscribe. You can automatically download our podcasts to your phone and automatically get alerts to when a new episode comes up. So we encourage you to do that. We’d love if you give us a great review because those help us too. Shawn: And we’ve really enjoyed doing this podcast for you guys. We’re going to start doing more interviews. But we definitely saw there’s a lot of questions around keto. Shawn: We saw that our podcast resonates with other podcasts around the keto diet, so we thought it was good to circle back. But if you guys haven’t listened, we have two great episodes breaking down the basics of the keto diet that are on the BioTrust Radio site or iTunes and Stitcher. I think it’s Episode 5 and 6. Tim: I was going to say 5 and 6, yeah. Shawn: So check those out. We’ve got tons of great feedback on those. I think it’s a great place to start. But this is a good place to circle back, so we appreciate it. Tim: Awesome, guys. Thanks for joining us.